Rat anti Mouse IgG2a antibody, clone LO-MG2a-9 (MCA421P) used to evaluate pathogen specific IgG2a production in mice following Trichuris muris infection by ELISA. E IgG2a production in naïve and T. muris infected APCmin/+ mice serum at day 42 p.i. * p<0.05, *** p<0.0005 n = 4 per group. 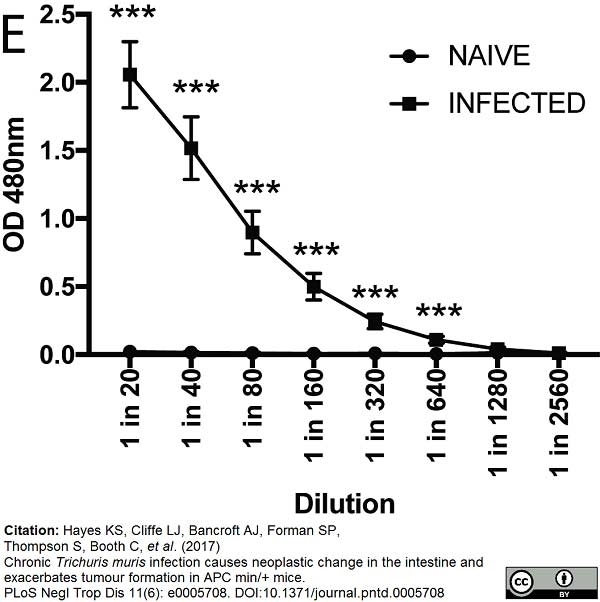 Chronic Trichuris muris infection causes neoplastic change in the intestine and exacerbates tumour formation in APC min/+ mice. PLoS Negl Trop Dis 11(6): e0005708. Biotin labeled Rat anti Mouse IgG2a Heavy Chain antibody, clone LO-MG2a-7 (MCA421B) used for antibody class evaluation by ELISA. 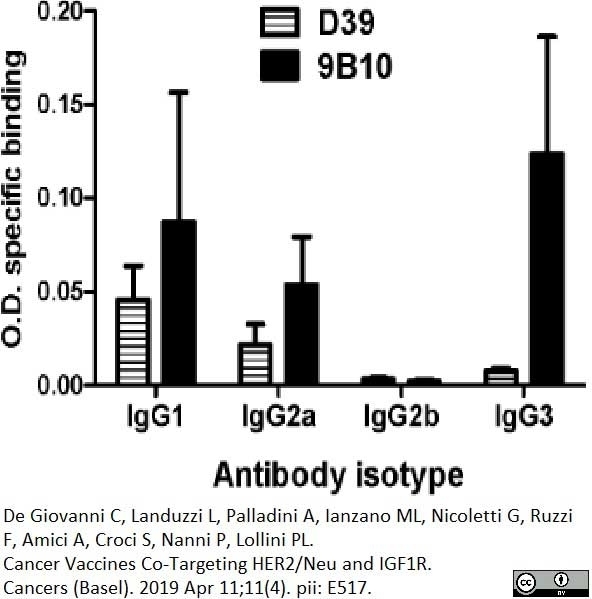 Rat anti Mouse IgG2a:Biotin, clone LO-MG2a-7 recognizes the gamma 2a heavy chain of mouse immunoglobulin and does not cross-react with other murine immunoglobulin classes or subclasses. Rat anti Mouse IgG2a Heavy Chain antibody, clone LO-MG2a-7 recognizes an allotypic determinant upon mouse IgG2a. It recognizes the IgHIa allotype (as expressed in Balb/c mice), but not the IgHIb allotype (as expressed in C57/BL mice). Where this antibody has not been tested for use in a particular technique this does not necessarily exclude its use in such procedures. Suggested working dilutions are given as a guide only. It is recommended that the user titrates the antibody for use in their own system using apprpriate negative/positive controls. Jarman, E.R. & Lamb, J.R. (2004) Reversal of established CD4+ type 2 T helper-mediated allergic airway inflammation and eosinophilia by therapeutic treatment with DNA vaccines limits progression towards chronic inflammation and remodelling. Prot Biol Fluids 615 - 8. Pergamon Press, Oxford and New York. Nagao, K. et al. (2003) Role of prostaglandin I2 in airway remodeling induced by repeated allergen challenge in mice. Am J Respir Cell Mol Biol. 29: 314-20. Bazin, H. et al. (1984) Rat monoclonal antibodies. I. Rapid purification from in vitro culture supernatants. J Immunol Methods. 66 (2): 261-9. Bazin, H. et al. (1984) Rat monoclonal antibodies. II. A rapid and efficient method of purification from ascitic fluid or serum. J Immunol Methods. 71 (1): 9-16. Philippine Science Letters 2: 38- 48. Ormstad, H. et al. (2000) The fungal cell wall component beta-1,3-glucan has an adjuvant effect on the allergic response to ovalbumin in mice. J Toxicol Environ Health A. 61: 55-67. Tan, L.K. et al. (2006) Intramuscular immunization with DNA construct containing Der p 2 and signal peptide sequences primed strong IgE production. Instanes, C. and Hetland, G. (2004) Deoxynivalenol (DON) is toxic to human colonic, lung and monocytic cell lines, but does not increase the IgE response in a mouse model for allergy. Liedén, A. et al. (2009) Cornulin, a marker of late epidermal differentiation, is down-regulated in eczema. Wolfowicz, C.B. et al. (2003) Expression and immunogenicity of the major house dust mite allergen Der p 1 following DNA immunization. Hayes, K.S. et al. (2017) Chronic Trichuris muris infection causes neoplastic change in the intestine and exacerbates tumour formation in APC min/+ mice. PLoS Negl Trop Dis. 11 (6): e0005708. Querinjean, P. et al. (1972) Transplantable immunoglobulin-secreting tumours in rats. Purification and chemical characterization of four kappa chains from LOU-Wsl rats. Eur J Biochem. 31 (2): 354-9.